stirrup is too long but I JUST got the saddle and threw it on. So I will be brief, for I am so short of time, lately. I took a flying launch off of Magnum, the Thoroughbred in mid flight jumping over the trenches up back. How you ask? Well....in a dressage saddle. NOT suppose to jump in them. My intentions were not to jump but have a nice ride up back and on the way home I just couldn't control myself and let him go. Well, so did I. Off that saddle into mid are and landed elbow, shoulder, hip. NO.........of course I am not hurt! Just pains me no one was there to enjoy the cartoon. 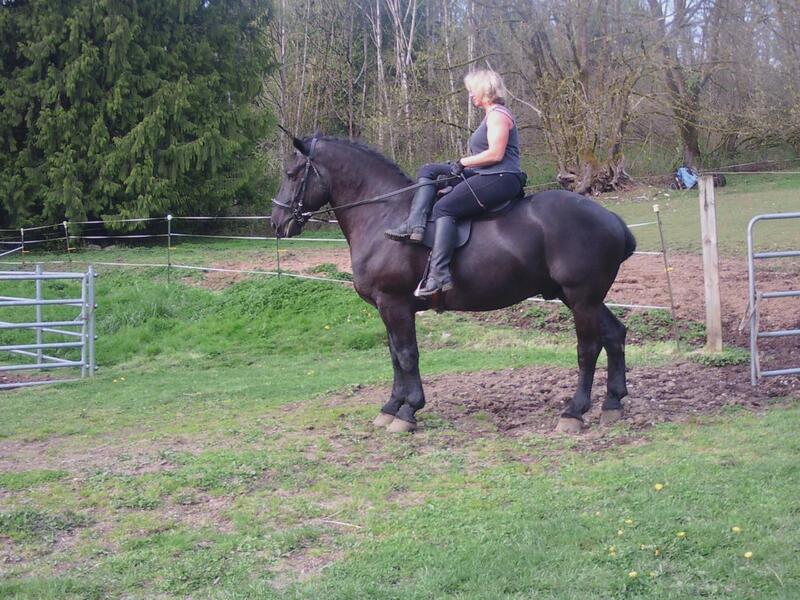 Got my side saddle for Tankus. What an amazing saddle! Made in 1925, treeless, for a draft or warmblood, or SOMETHING big, Gawd only knows back then. It is stamped Champion and Wilton, By Appointment to his Majesty, the King. Whatever that means. I am intriqued and have no idea, for Champion and Wilton is no more. Anyway, I put it on him every time I get back from our ride to get use to it. I am not comfortable enough to ride up back and over the trenches, but getting better.. So lastly for now, my dear friend Sheila Bleck qualified for the Olympia this weekend in NYC , her pro debut! I am so excited because finally, we have another perfect female bodybuilder with creativity, heart, and perfect symmetry. I am so proud to be her friend and make her suits for years.